Choosing where to dine out in New York City can be a tough decision. From street vendors to Michelin-starred restaurants, The Big Apple offers an endless choice of tantalizing options comprised of tastes and flavors from all over the world. 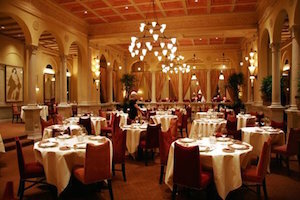 Dining out in New York is an unforgettable experience that combines exceptional food and drink with an intoxicating atmosphere and world-class service. To sample the very best in fine dining that the city has to offer, you need look no further than world-renowned chef Daniel Boulud’s flagship restaurant DANIEL on Manhattan’s Upper East Side. As you would expect of a two-star Michelin restaurant, the food at DANIEL is nothing short of extraordinary. Starters range from a delicate chilled artichoke soup with porcini confit to a rich duck terrine served with pickled autumn berries and poached bosc pear. There are four different caviars to choose from starting with the pointy snout white sturgeon at $210 for 50g all the way up to the golden ossetra which commands a price tag of $470. The entrees offer a spectacular range of fish such as the pan-seared black sea bass on a bed of kabocha squash and potato served with nasturtium salad. Those who are in the mood for something truly spectacular can go for the Scottish grouse stuffed with foie gras served with Brussels sprouts, turnips, cranberry confit, and Dalmore whiskey jus. The tasting menus offer delights such as squab terrine with pistachio and calvados or the crusted sea scallops with celery mouselline and matsutake. French cuisine is renowned for its show-stopping desserts, and DANIEL has certainly upheld this proud tradition. Try the warm guanja chocolate coulant drenched in liquid caramel alongside a milk sorbet, or opt for the fruity jardin exotique with tamarind parfait, papaya, pomegranate, and a passionfruit and mint sorbet. Additional sorbet flavors include cassis-basil, mirabelle-gin, and strawberry-sauternes. If the food is not impressive enough, then the wine list is certain to take your breath away. DANIEL offers 2,000 different wines — spanning 15 countries — all of which are kept in a state-of-the-art wine cellar where the temperature and humidity are carefully controlled to ensure all of the wines are served at the perfect temperature. Prices range from as low as $25 for a Riesling up to an eye-watering $10,000 for a bottle of Chateau D’Yquem 1918. Although dining at DANIEL may not come cheap, it is a truly remarkable experience that will stay with you for a lifetime. Dinner: Monday to Saturday 5:30 p.m. to 11:00 p.m.